Power of Wind Contest – Deadline to Apply Aug 15, 2016! 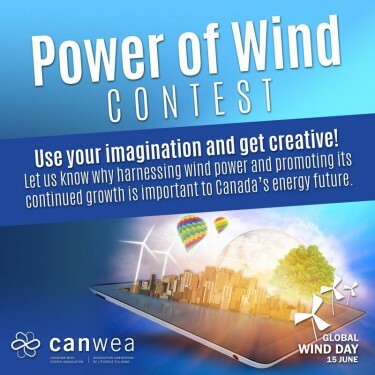 To celebrate Global Wind Day, the international annual day for discovering the power of wind, and the growing contribution of wind energy in Canada, the Canadian Wind Energy Association (CanWEA) is launching its annual Power of Wind contest. Students entering or in post-secondary education are invited to share their vision of how wind energy can contribute to Canada’s future by submitting a photo or visual image that illustrates, expresses or in some way conveys that vision. The contest will run from June 15, 2016 (Global Wind Day) to August 15, 2016. The winners will be announced in Calgary, Alberta at the CanWEA Annual Conference and Exhibition, November 1-3, 2016. Winning entries will receive a $1,000 bursary prize and placement in the 2017 Friends of Wind Calendar.